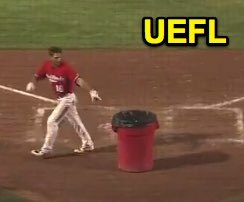 Monday's independent league game between the Chicago Dogs and Fargo-Moorhead RedHawks of the American Association took an odd turn when ejected batter Brennan Metzger concluded his temper tantrum by taking a garbage can from the dugout and placing it behind home plate as HP Umpire Mike Jarboe discussed Metzger's expulsion with Fargo-Moorhead manager Michael Schlact. Metzger points at his greatest achievement. The Play: With one on (R2) and none out, Metzger took a 3-2 pitch from Dogs pitcher Trevor Simms for a called third strike as F-M baserunner R2 Tim Colwell stole third base. At the time of the ejection, the game was tied, 3-3. The RedHawks ultimately won the contest, 4-3. Following Metzger's generous dose of earlier profane insults and complaints, he placed a trash bin behind home plate, pointed to the red cylinder and told the umpire, "Go to your home," all while umpire Jarboe was calmly conversing with manager Schlact. Who's to say if the umpire even saw Metzger's juvenile antics. And they wonder why there's an officiating shortage.